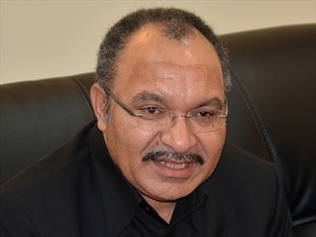 THE Supreme Court has ruled that a warrant issued by a lower court for the arrest of Prime Minister Peter O’Neill is equivalent to a court order which must be complied with and implemented. The five-man Supreme Court panel comprising Justice David Cannings, Justice Colin Makail, Justice Don Sawong, Justice Goodwin Poole and Justice Lawrence Kangwia made the interpretation in the Waigani court yesterday. The National Court had in July referred to the higher court constitutional issues relating to the commissioner’s powers as regards arrest warrants and contempt charges. It followed an application for a judicial review filed by Police Commissioner Geoffrey Vaki on a warrant issued by the district court to arrest Prime Minister Peter O’Neill. Two senior police officers had obtained the arrest warrant from the magistrate. Cannings, when delivering the 59-page judgment, told the court that O’Neill’s arrest warrant was a command in mandatory terms that demanded obedience. “In our opinion the warrant issued by the Chief Magistrate on June 12 is an order of the district court and the (police) Commissioner therefore has no power to direct or control Chief Insp Timothy Gitua as to how and when he should exercise it,” he said. The National Court (not the district court) has powers to punish for contempt of the district court, contempt offences other than those created by section 277 of the District Court Act, and in an appropriate case a person including the Police Commissioner, may be prosecuted for contempt of court constituted by disobedience of a warrant of arrest issued by the district court. Peter O'Steal is a criminal minded man. PNG and Ialibu Pangia people don't vote him in coming elcetion. He's a Australian puppet.